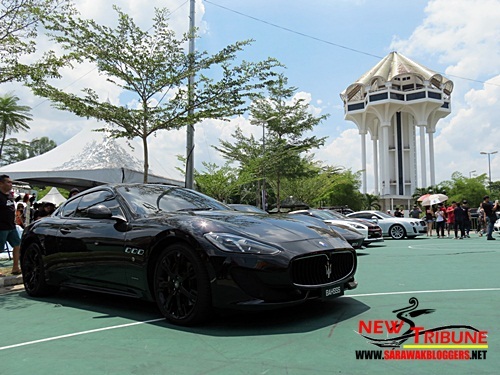 The recent Merdeka Auto Carnival 2013 was really a feast day for car enthusiast because there were possibly over 1,000 over cars parked and displayed at Le Park (previously known as the Kuching Integrated Recreational Centre). Cars from all kinds were parked nicely with some modified, to extends you can’t figure out its original model anymore. These cars had such a huge makeover, and I wondered of the cost the owners had to bear for each car. But I am sure that these car enthusiasts didn’t mind of such cost, just like I’d not worry about splashing money for the computer related gadgets. When something is a hobby, sacrifices are made willingly, and I bet this is the case for these car owners. But that’s not all; the whole carnival also had a wide range of activities for the public, so no one was really left out despite the cars taking centre stage. Booths selling food and drinks, including car related merchandise were evident at the carnival area with many taking the opportunity to check out what was offered. The good but humid day helped especially the drink vendors, as I noticed thirsty visitors swarming the canopies housing these vendors. Just like a typical American movie, street dancers were also given a slot at this carnival with them being one of the highlights of the night event. If you have watched Fast and Furious, or maybe Step-Up, you’d know how much street dancing is related to auto events. Aside from the dancing, there were also night drifting, which for me was like cars dancing as well. The skills used during such drifts were really something I wished I could learn some of the tricks. But well, I was told that drifting will need you to dig deep into your pockets due to the tires being worn-off faster, and so I decided to forgo that intention. Even this jeeps made their way to the carnival. 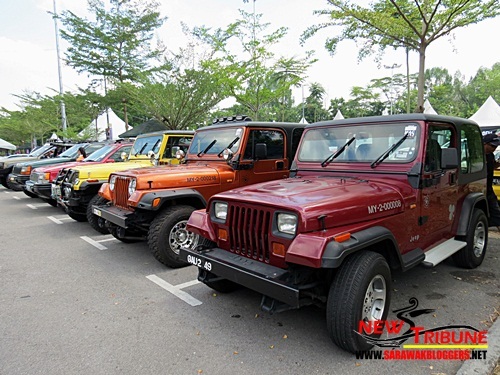 Sunday proved even more interesting as a massive number of cars, all representing the auto groups around Kuching came together to form one of Kuching’s biggest car convoy. 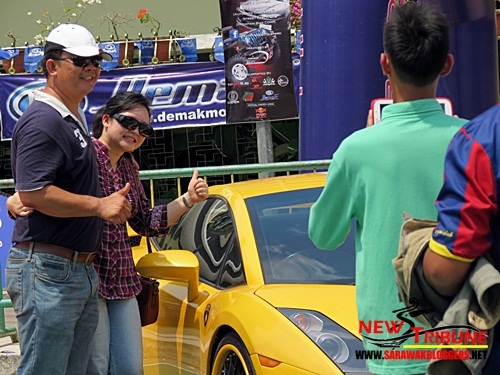 A drift joy ride was also in session with drifters showing off their amazing handling skills to the public. A car enthusiast told me that drifting during the day was more costly and dangerous as the road itself would heat up the tires faster, allowing accidents to happen more frequently if one is not careful. Acrobats using a motorcycle. Dangerous stuff! 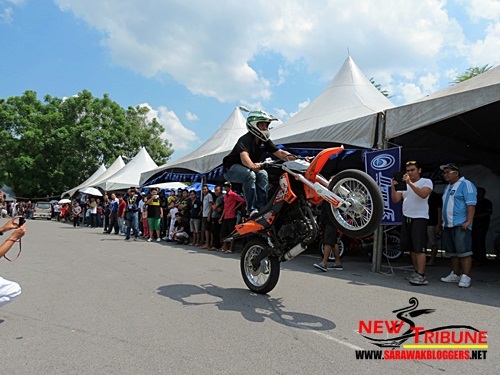 Some awesome motorcycle acrobatics, soon made the crowd cheer harder as they pushed their motorcycles to the limits. The motorcyclist, clad in all safety gear performed numerous stunts which really thrilled everyone watching. Models at the Merdeka Auto Carnival. They were certainly a good addition to the event. Not far from the stunt area, beautiful models continued to pose for photographers as the event moved towards its peak. I noticed some girls also decided to model for their partners besides not less than four expensive cars, one which I could identify as the Lamborghini. With the sun slowly coming down, the event called it a day with everyone, particularly the organizers glad the whole Merdeka Auto Carnival was a huge success. Aside from knowing more about cars that day, the event also made me feel like I should do something to make my car look better, and run smoother. Well, maybe when I’m done with that, I could join the even bigger Merdeka Auto Carnival next year.